Once known as xSQL Object, xSQL Schema Compare is a solid, basic schema comparison tool." You can perform comparisons against live databases or database snapshots, although not against backup or creation script files. The product also supports cross-version comparisons and synchronization. For example, you can compare a SQL Server 2005 database with a SQL Server 2012 database. The tool can then generate version-specific change scripts as well as schema snapshots to support auditing and rollbacks. In addition, you can open your synchronization scripts in SSMS or other applications. The scripts are wrapped in a single transaction, so changes are rolled back if a synchronization fails midway through. Also included in xSQL Schema Compare is a command-line utility that supports unattended operations. Like many schema comparison tools, xSQL Schema Compare is available in two editions: Lite and Professional. But unlike most of the commercial products, the Lite edition is free. That means no costs or trial-period expirations to contend with. On the other hand, the Professional edition starts at $349. 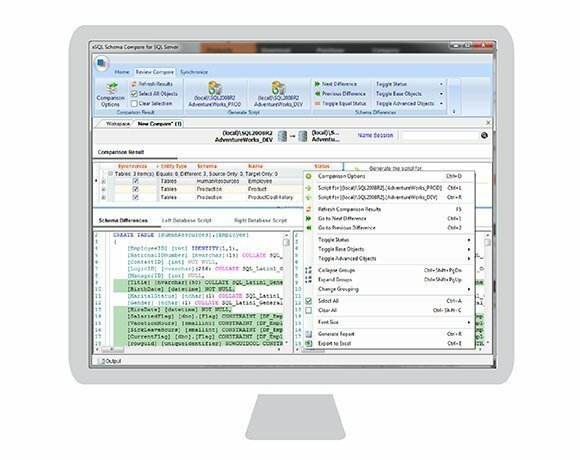 If working only with SQL Server Express databases, Lite is all you need. There are no differences between editions at this level. However, for all other SQL Server databases, Lite operations are limited to 25 tables and 40 views. Any more than those, you need Professional.